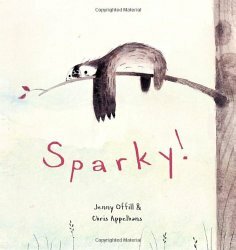 ﻿ Sonderbooks Book Review of Sparky! Review posted July 22, 2014. The girl in this book wants a pet. After much begging, her mother promises that she can have any pet she wants as long as it doesn't need to be walked or bathed or fed. She tries to play with Sparky. He's not very good at Hide-and-Seek or Kung Fu Fighter, but he's very very good at Statue. When another girl from school is critical of her pet, Sparky's owner decides to present a Trained Sloth Extravaganza. Unfortunately, the only trick Sparky learns well is playing dead. Interestingly, this book doesn't end with a big bang or a punchy lesson. But we close with the girl sitting in the tree next to Sparky. "You're it, Sparky," I said.